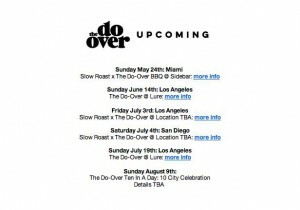 SUNDAY – AUG. 9TH: THE DO-OVER 10 YR. ANNIVERSARY IN 10 CITIES IN 1 DAY! 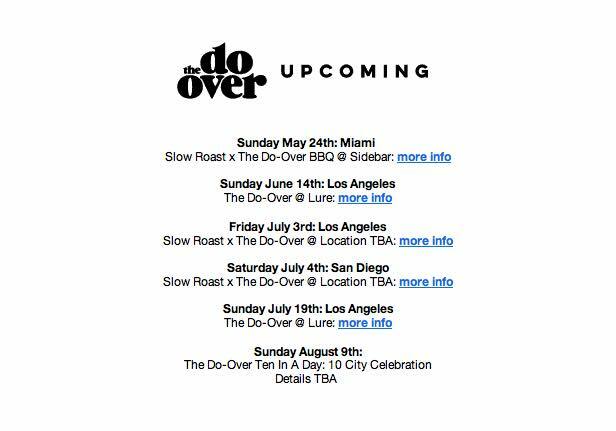 Sunday (Aug 9th), The Do-Over crew will be finishing off the summer & their 10 year anniversary by doing something extra-ordinary…..celebrating the Do-Over in 10 cities in 1 day! Yup, you heard right….“10 Cities In 1 Day!”. Austin, Atlanta, Brooklyn, Detroit, Honolulu, Los Angeles, Miami, Paris, Portland, & Toronto. Alot of Surprise Special Guests will be showing up at these parties….you just never know who will show up. There’s even rumors that a couple of Beat Junkies might be in the place…..
Congratulations to our good friends Chris Haycock, Jamie Strong, & Aloe Blacc for throwing the best damm party in the planet for 10 years strong! Whatchawannado? !